Many factors contributed to the resounding defeats suffered by the Sri Lankan squad in Australia, A few were dictated by the dice of the gods. But as many were due to serious shortcomings in the capacities displayed by individuals in the team on the field. Bad Luck: Miss or Mister Misfortune visited the Sri Lankan team to a degree beyond the normal. One blow was delivered before the squad reached the shores of the Continent. Angelo Mathews, probably the best of the batsmen and certainly the most experienced batsman for Australia, was ruled out (once gain one must sigh) by a hamstring injury. 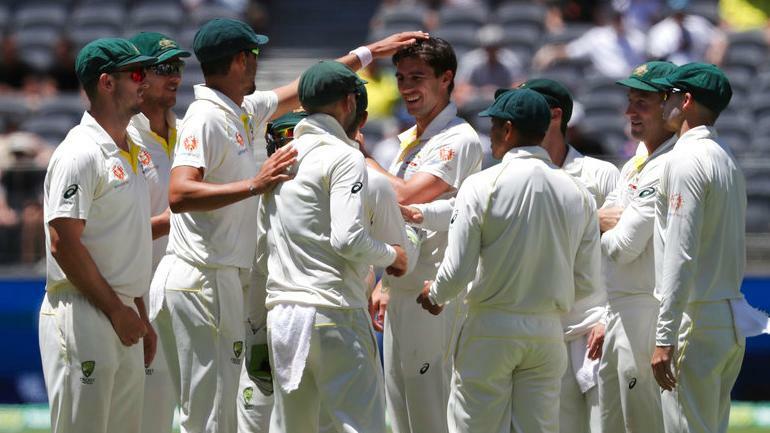 Thereafter, three of the pace bowlers, were injured or incapacitated after the Brisbane game – with Suranga Lakmal’s absence after a sterling effort at the Gabba, the most calamitous of them all. The sharpest Strike of Mister Misfortune, however, was in the two head injuries suffered by Dimuth Karunaratne and Kusal Perera. Not just the hits, but their TIMING. On the second day of the Test Karunaratne was hit after the two openers had built up a promising stand of over 80 runs in the first innings. 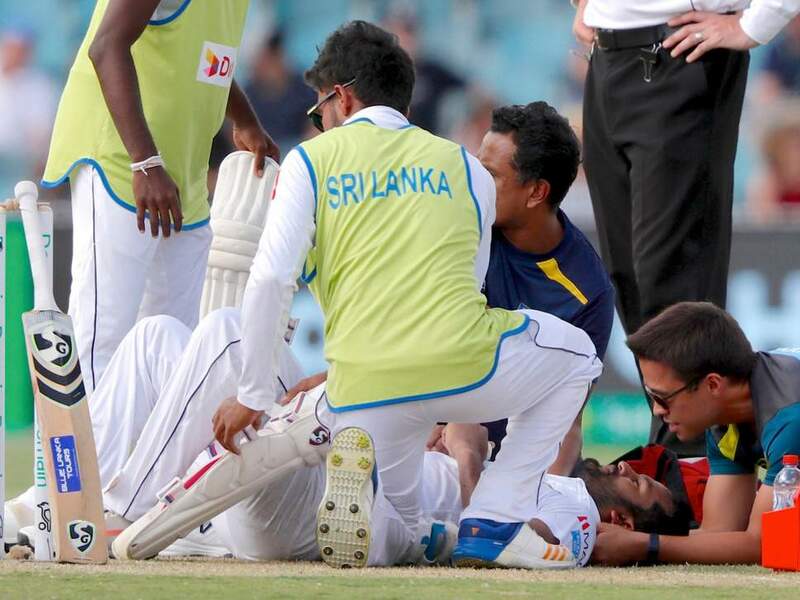 He was carried off and taken to hospital (returning to bat the next day). As so often when a striking event, whether a marvellous catch or unbeatable ball, occurs, the fielding side effects more breakthroughs. 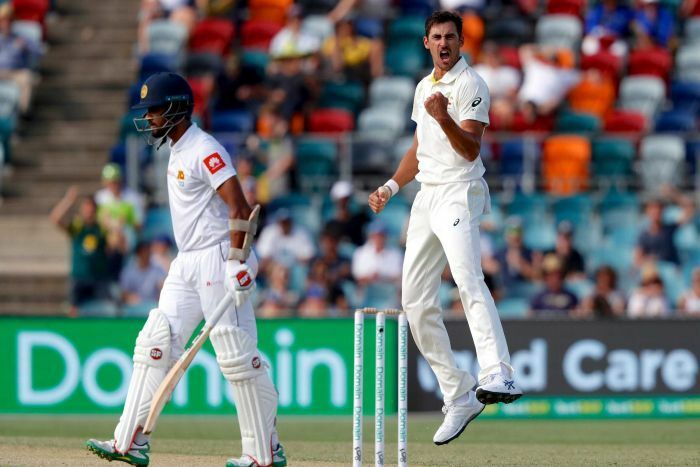 With Karunaratne’s departure, Thirimanne was winkled out by Lyon (32nd over); Mendis was bowled by Cummins (35th over) and Chandimal was removed by Starc (41st over). Quite a stark descent from a small foundation of comfort. Worse luck hit Sri Lanka on the third day. After Kusal Perera and Dhananjaya de Silva had grafted about 40-50 runs, Perera was hit on the helmet by Jhye Richardson and forced to retire because of dizziness. De Silva fell immediately afterwards and in a clatter of wickets, including that of Karunaratne, Sri Lanka slid from 180 for 3 to 215 all out – with Perera unable to bat because he was being checked out in hospital. The head hits were not the result of deliberate bowling aim; but the product of pacey bowling on a pitch with some uneven bounce. And…………………. There is another factor: the issue of batting technique in the face of such pace barrages. Having never faced this problem myself in Lanka or UK and only occasionally in Australia at my level of cricket, I cannot claim expertise on this technical issue. Fortunately, the commentators did discuss the topic on at least one occasion. Allan Border indicated that one had to duck or sway. He himself favoured the sway. Easy to pronounce. How to execute. I would opt for the sway because your eyes are still in operation. But ….. !!@#!! The Australian’s use of the bouncer at top-speed not only removed players via head hits, they got at least two wickets. Chandimal and Dhananajaya both attempted ungainly hooks: Chandimal nicked the ball to the keeper, while Dhananjaya failed to nick but hit his own wicket with loose bat in unseemly fashion. These events revived a moment in my own cricket history: when I nicked a bouncer at head height to the wicket-keeper attempting such a hook – yes, caught by surprise at B grade level in Adelaide while aged in my forties. A poor stroke. Doubly poor when aged in one’s twenties. Due credit must be attributed to the three Australian pacemen: Cummins, Starc and Richardson. The Manuka Oval was nowhere close to the bounce and zip of the Gabba, though a measure of uneven bounce did offer hope. Proof of the difference is witnessed in Sri Lanka’s respective bowling figures. Despite this relative difference, the three Aussie fast bowlers bowled very well. The major difference in the two games lay in the increased speed and threat injected by Starc in comparison with his performance in Brisbane. Figures of 5 for 54 and 5 for 46 earned him the Man of the Match award. Michael Atherton recently indicated that Joe Root, England’s best batsman, was dismissed by a brute of an unplayable ball in the Second Test in the West Indies. In cricketing terminology that is a “jaffa.” The classical jaffa is a fast seaming ball that swings in towards middle-and-off stump, but then jags a mite and hits or clips the off-stump (if it has not earned a snick to keeper or slip). Two head knock-outs. Two jaffas. In one match! Yes, within one match. Truly rich pickings for the Aussies – fruits of good bowling, but rather unusual. The SrI Lankan team deepened their plight by squandering several catching chances –though Kusal Mendis at slip again displayed excellent hands and made some tough chances look simple. The worst drop was Thirimanne’s fumble at short-leg off Kurtis Patterson in the 2nd innings – a drop that enabled Patterson to score a century. However, this occurred when the score was 335 for 4 and the trouncing was well-advanced. 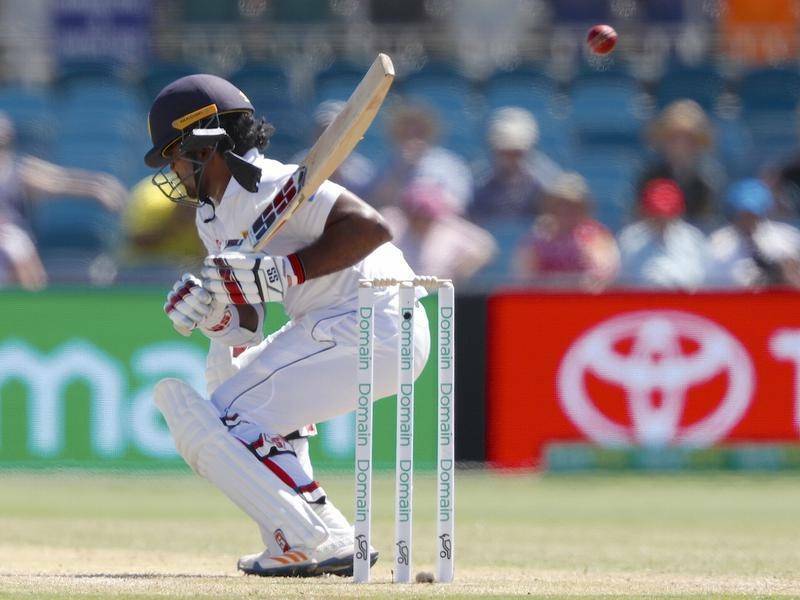 Dhananjaya’s miss at slip off Joe Burns was more damaging – a tough chance, but takeable. At present, Sri Lanka seem to have a long line of pacemen whose batting capabilities are negligible. They are, in cricketing parlance, “bunnies” or easy marks. So, number 9, 10 and 11 in the batting order do not secure many runs. Worse still, they do not usually hold one end up so that the batsman at the other end when No. 9 walks in is induced to bat with ingenuity if not desperation. Lakmal is one of the relatively stickier batsmen among the pacemen, but he was hamstrung and out of the Canberra Test. The weakness of the tail from Nos. 10-11 rendered Chamindra Karunaratne at No. 8 and Dilruwan Perera at No 9 into vital cogs in the batting wheel. Dilruwan (usually at No. 8) has rendered vital service in this role in the past — though this work has usually been on Sri Lankan batting surfaces). However, at Manuka Oval he only mustered ten runs in 45 balls and 04 runs in 9 balls. His bowling returns were also relatively poor: 0 for 112 and 0 for 52. He has been jettisoned for the South African tour.